I had an extraordinary telephone conversation last night with a woman who I have never met before but, I learned late last week, is a distant relation. I began my genealogy in a casual way several years, beginning by sitting down with my father one summer evening to make sure that what he knew did not get lost to the sands of time. His health was in decline for several years and it was obvious his time was coming soon. With mom it has been more of a process. Let’s just say she is not the reflective type who enjoys putting the pieces together one by one. Getting details from my mother is done surreptitiously, usually a quick text or email to see if she can flesh out the outline of a life that to me is nothing more than a record on my computer. Done in this manner I have been able to get a fair amount of information. And at the risk of getting her mad I would dare say she enjoys it when kept to a minimum. Some of you know that I am in the beginning stages of a biography of Union general Joseph Roswell Hawley. Hawley was a captain in the 1st Connecticut, a ninety day unit, and later a colonel and brigadier in the three-year 7th. Seeing where he fought at First Bull Run this pat Sunday was something special. He was something of a Zelig, always turning up where events were taking place. 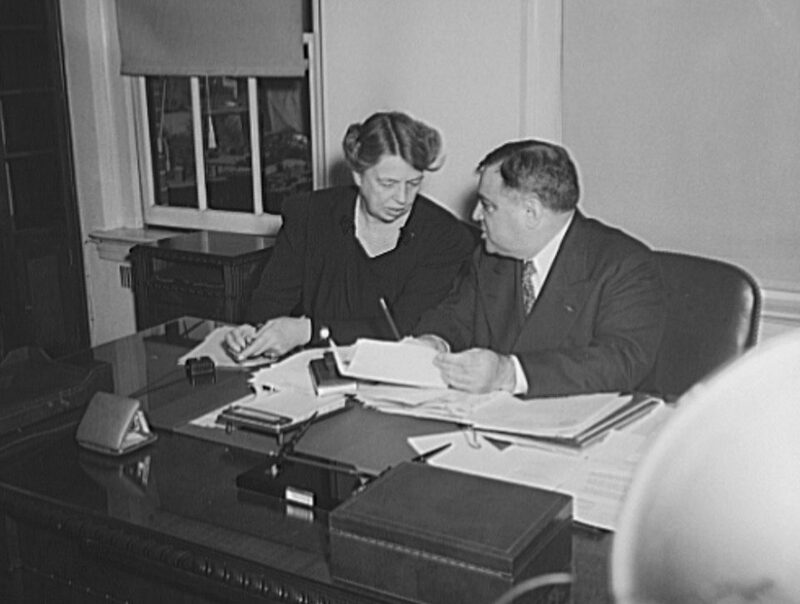 After the war he was the governor of Connecticut, and eventually a congressman and senator. The whole reason I found Hawley was because the urban legend in my family was that we were his direct descendants. If the legend had been true I would have been his great, great grandson. The short version of the story is that I am not. That brings me back to the phone call last night. The reason for the family legend was that we indeed have Hawleys in our family tree, on my mother’s side of the family. We just never knew anything about them. As it turns out it was the other side of the Hawley family to which we are directly related. I had wondered how part of the family ended up in Nova Scotia way back when. From last night’s conversation I know that they were Loyalists during the Revolutionary War and that they fled shortly after the upstart colonists declared victory. I would label my own proficiency as a genealogist as high-beginner. I had put it aside for awhile, even letting my Ancestry account lapse early this month, because I had hit a wall. Sometimes when you least expect it the door opens again. The biography is still very much in the early stages but is proceeding nicely. It is a story worth telling, and one that fell into my lap wrapped in a bow imploring me to tell it. Posted by Keith Muchowski in Monuments and Statuary, Washington, D.C. I just got back from DC. The Hayfoot and I had a good time. Being in the nation’s capitol on Memorial Day Weekend is always special. It was a great beginning to the summer. For starters, I have made it my goal to dedicate Memorial through Labor Day to reading novels and short stories, fiction being something I have gotten away from in recent years. To that end, I kicked off by reading John Williams’s 1965 Stoner on the bus ride up ad down. It is sort of The Death of Ivan Ilych if the protagonist were a frustrated academic living in Middle America in the early to mid twentieth century. I think this fiction thing is going to work out well; there is a lot of literature, in different genres, I wasn’t ready for as a younger person that I think will speak to me now. I also got an interesting email from my sister on Saturday. She received a phone call out of the blue from a woman who is distantly related to us. I began my genealogy in earnest about a year ago and have become something of the de facto family historian. My sister gave me the woman’s contact information and I intend to call her now that I am back in town. As I mentioned the other day, we planned to visit the Old Soldiers Home/Lincoln Cottage on Saturday. We did, and had a great time. 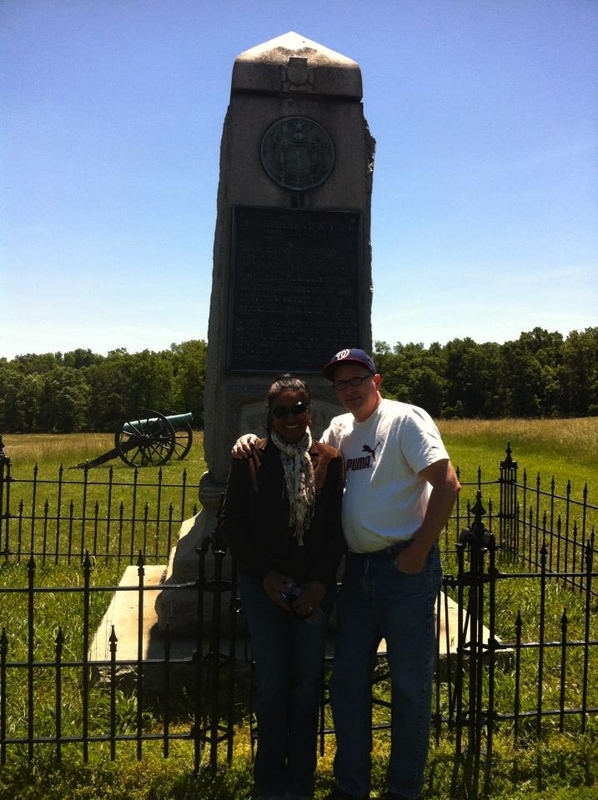 The wife surprised me by arranging a visit to Manassas on Sunday with some friends of ours. 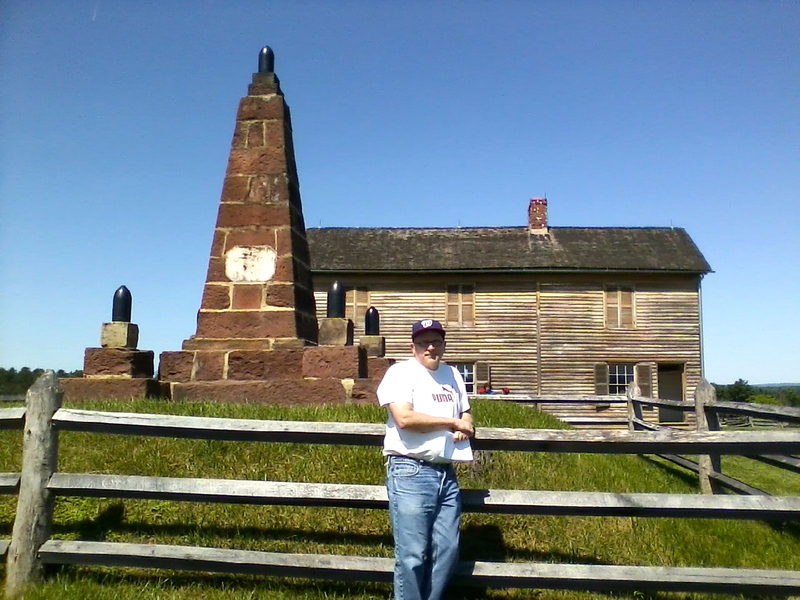 I had never visited Bull Run before. It was a special day. Here, quickly, are a few pics from the weekend. President and Mrs. Lincoln spent more than a quarter of their time at the Old Soldiers Home. The Home, the grounds of which include the presidential cottage, lies about 3 1/2 miles north of the White House. 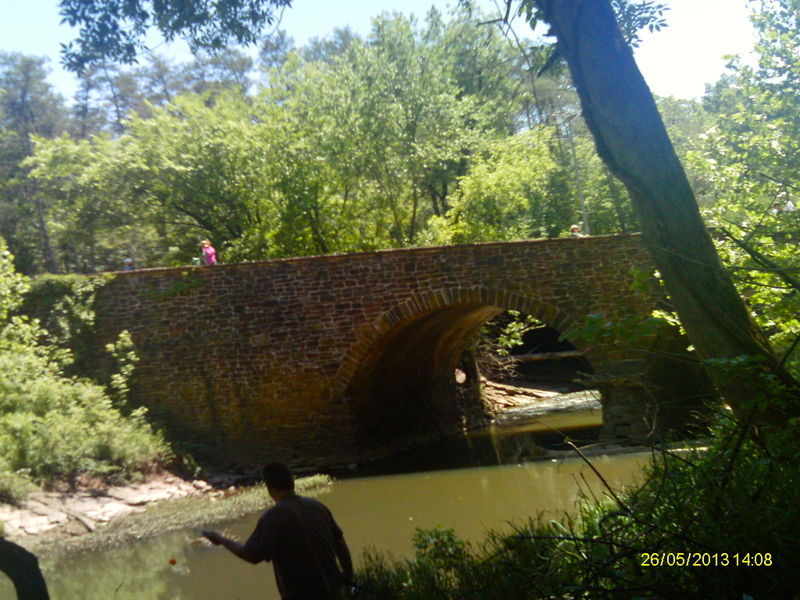 Here Lincoln was able to get away somewhat from the city’s oppressive heat and endless stream of supplicants asking for favors. There was little respite, however. In a painful reminder of the war’s human cost, this cemetery was within sight of the cottage. From the window of his study Lincoln could see the graves adding up. 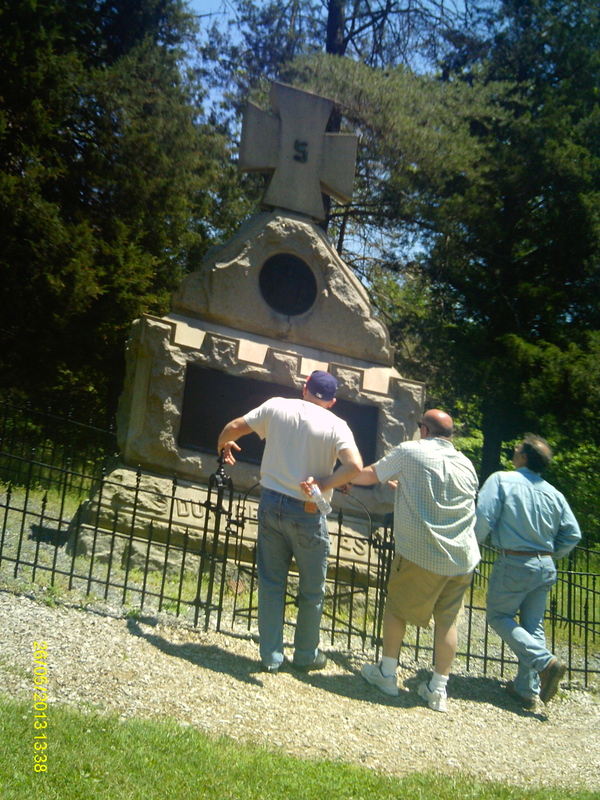 This monument atop Henry Hill was dedicated in June 1865 and was one of the very first constructed. A living history unit representing the 14th Brooklyn was in attendance. 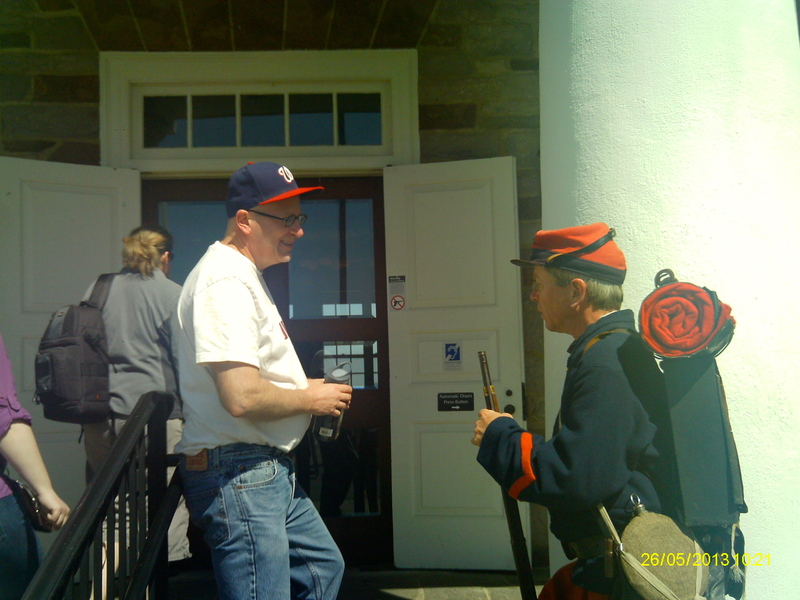 The 14th was one of many New York zouave units at both First and Second Manassas. 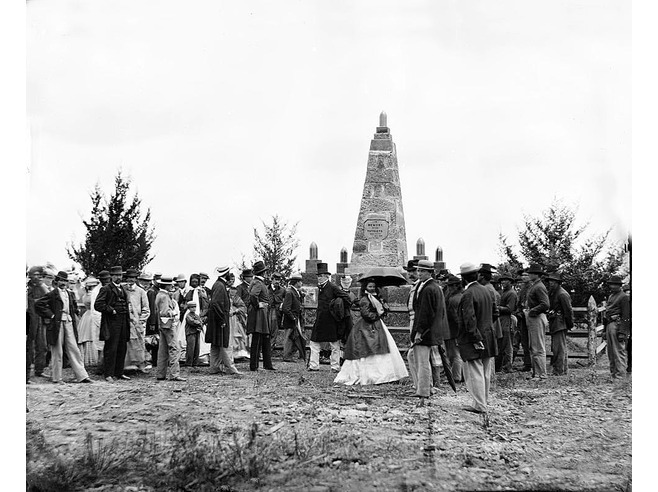 In July 2011 I blogged about the rededication of the New York monuments at Bull Run during the Centennial fifty years ago. It meant a lot to finally see them in person. Overall it was some weekend. Thank you honey, and to everyone else who made it happen. Hey all, I took the Boltbus to DC. 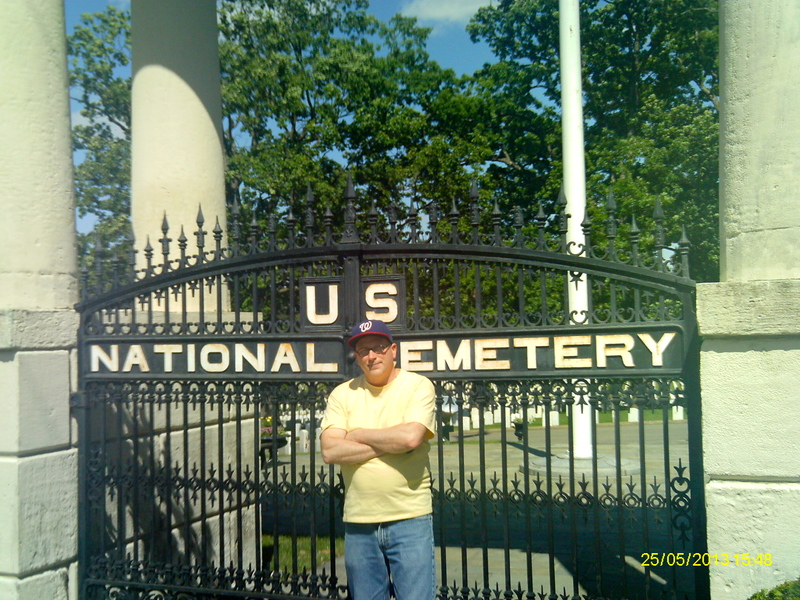 The Hayfoot and I are going to Rock Creek Cemetery and the Old Soldiers Home tomorrow. I noticed that today is the 130th anniversary of the Brooklyn Bridge and thought I would repost this from 2011. The Bridge is one of the special places in NYC. Enjoy your Memorial Day Weekend. 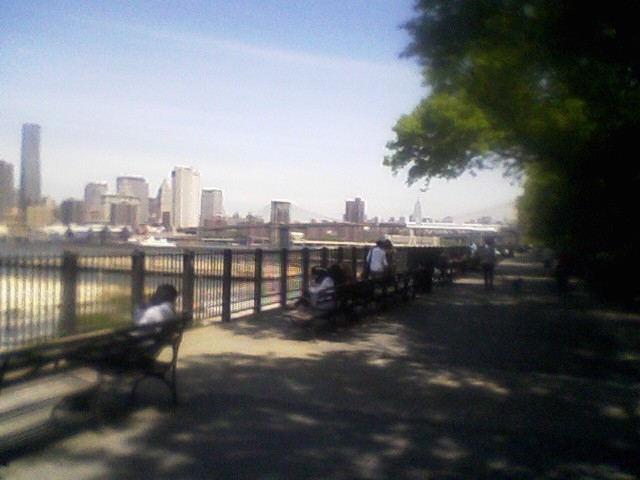 Earlier this spring I read The Great Bridge, David McCullough’s magnum opus about the creation of the span connecting Brooklyn and Manhattan. One reason for doing so was because, after spending so much time reading about the death and destruction of the Civil War, I wanted to turn my attention to something being built not destroyed. The bridge is down the street from where I work and I often have my lunch there. It is also where I took my wife after our wedding reception. 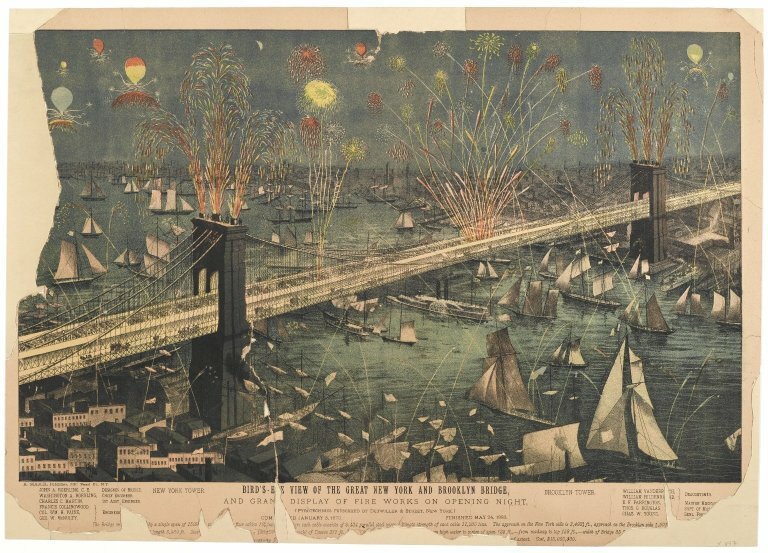 Yesterday was the one hundred and twenty eighth anniversary of the opening of the Brooklyn Bridge. 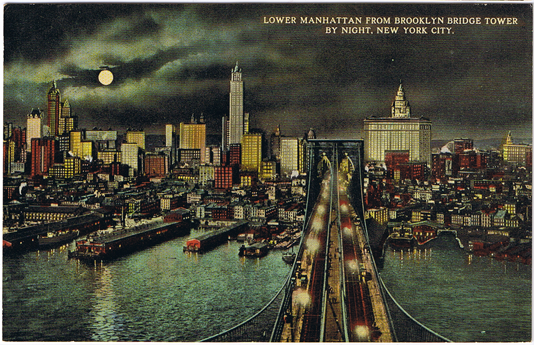 I sometimes think many New Yorkers assume the bridge has always “been there,” a natural part of the landscape. Actually it was the brainchild of German-born John Augustus Roebling, who was wounded on the construction site and died prematurely years before the bridge’s completion. 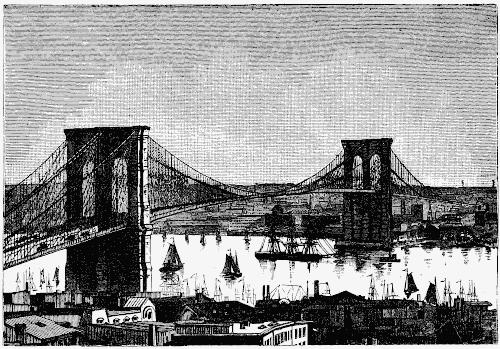 It was up to his son, Colonel Washington Augustus Roebling, to complete the task. He did so, but at great personal expense. Roebling contracted caisson disease, or the bends, from his frequent trips below the water to the excavation site and suffered in horrific pain the rest of his long life. He lived until 1926. Roebling was an officer in the Army of the Potomac and participated in many of the war’s most important events. He fought at Antietam, Chancellorsville, Gettysburg, and the Wilderness among other places. He also personally witnessed the engagement between the Monitor and the Merrimac in 1862. Roebling married Emily Warren, the sister of General Gouverneur Kemble Warren, in January 1865. …it takes a leap of faith to imagine it as it was just after its completion. The road in the top photograph is the Brooklyn-Queens Expressway. 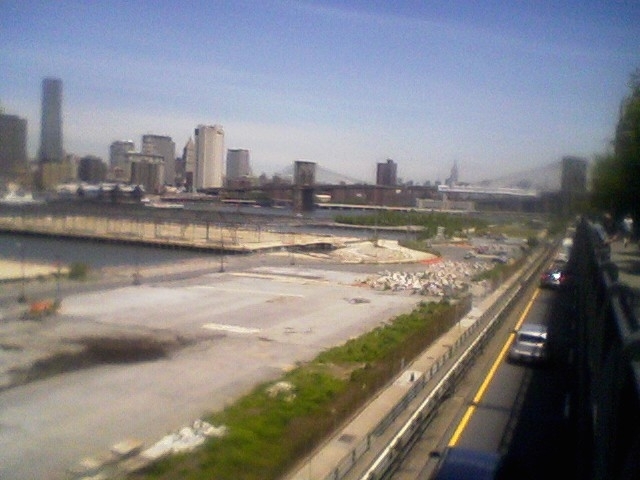 Below that in the same photograph is a new park being built along the Brooklyn side of the East River. The waterfront has not been part of the daily fabric of New York life for decades, since the collapse of the shipping industry in the mid-twentieth century. The city has been working hard to change that in recent years with a number of adaptive reuse projects. The bridge has always been a favorite of painters and poets. 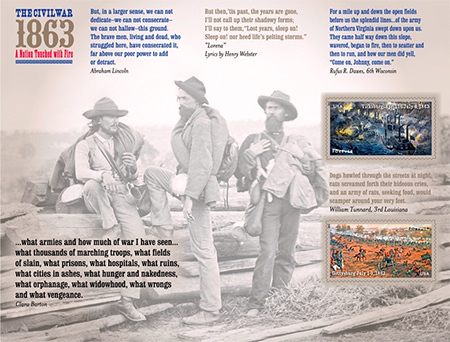 In what has become a Strawfoot tradition I am here to announce that the 2013 Civil War sesquicentennial stamps have been released. In fact, they were released just today at ceremonies in Mississippi and Pennsylvania. I found out when I stepped into the Grand Central Station post office this morning on some other business. I was unable to buy them today though, because, as is the custom with all commemoratives, they will not be available nationally until tomorrow, the day after issuance in the city of release. Hearing this news today made me realize that the sesquicentennial is moving along. It is more than half over. Last year I was speculating on which two subjects would make the cut. Vicksburg and Gettysburg really are the only logical choices, especially as Emancipation received its own seperate release a few months ago. I would strongly recommend buying a souvenir sheet, along with another set with which to make first day covers if one is so inclined. As I posted in a comment on Kevin Levin’s Civil War Memory blog awhile back, the USPS has done a great job with this series. Each year-set of two stamps obviously fits aesthetically into the larger whole, which is what you want in such a project. The stamps also have a stateliness and gravitas that, sadly, went missing in some of USPS offerings over the past 15-20 years. A little frivolity and playfulness in philately is fine; ultimately however, a nation’s postage says something about what its people find important. This is especially true when the subject is as significant as a nation’s civil war. I am glad they got the message. And here is the Postal Service’s press release with more information. Last night I booked the hotel for the New York History conference in Cooperstown early next month. The NYSHA conference should be a lot of fun. With the cool weather we’d been having in New York, June seemed so far away until yesterday. Today, though, has been the warmest day of the year so far, and the rising temperatures had everyone talking about their summer plans. It is difficult to believe Memorial Day weekend is a few days away. This afternoon I submitted my annual leave requests for June-August. I will be splitting time between here and our place in DC. Today I also joined Shorewalkers, a group that hikes various points of interest in the New York area. There is a walk in August that covers the Civil War and other monuments of Hoboken and Jersey City that I am especially looking forward to. I intend to criss-cross the five boroughs this summer, in a group setting but also by myself, to explore New York history, especially out-of-the-way New York history. My list is growing. It is a drizzly Sunday morning here in Brooklyn. I noted with pleasure earlier this week that the bibliographic information for volume one of Mark Lewisohn’s three-part history of the Beatles has just been released here in the U.S. (It had been on Amazon’s UK website for some time now.) It is titled All These Years: Tune In and brings the Fabs up to 31 December 1962, on the cusp of Beatlemania. Tune In has been in the works for nearly a decade now and is destined to be a huge deal in the Beatles’s historiography. As with Civil War historiography, there is much we have to unlearn about the Beatles before we understand their true history and significance. So much of what we “know” is simply the same self-serving narratives and folk tales told again and again until becoming accepted as fact. That will not be a problem with Tune In and the two volumes that come after it. Lewisohn is one of a handful of people who can pull off such a magnum opus. I would say Bruce Spizer and Allan Kozinn are probably the only two others. Lewisohn has said that there will be an “official cut” and longer “author’s cut” with greater detail. Unfortunately it appears there are no plans to release the author’s cut in the United States for the time being, though the publisher is leaving its options open. The smaller version still logs in at 1,200 pages. Interested parties may want to pre-order from their online bookseller. I had a meeting in the city today and afterward went to the nearby New York Central Library to do some research. The Conference on New York State History in Cooperstown is now just three weeks away. My presentation is on how Theodore Roosevelt Sr, William E. Dodge and other Republican leaders assisted in the Union war effort and then rebuilt the city in their own image when the fighting ended. A mistake many people make is to think of New York history, especially New York City history, in vacuum, placing it outside the scope of wider events in our national story. It is understandable in a way; the city is so complicated and densely layered that it is easy to think of it as its own thing. I am trying to avoid that in my discussion. Overall I feel pretty good about how the talk is coming along. Another reason I was at the library was to get ready for the upcoming season at Governors Island National Monument. It reopens next Saturday, Memorial Day Weekend, and will be open to the public on weekends and holiday Mondays through the end of September. This week I re-read chunks of Barnet Schecter’s The Devil’s Own Work: The Civil War Draft Riots and the Fight to Reconstruct America. I find Schecter’s book helpful because he puts the draft riots into broad context without losing sight of the scale and human cost of the violence. It is difficult to wrap one’s mind around the idea that thousands of individuals battled in the streets of Manhattan against, not just police, but battle-conditioned American soldiers. And these weren’t just angry mobs. The rioters showed tremendous tenacity, organization, and unity of purpose, and sustained it for nearly a week before eventually succumbing to hastily-gathered greater force. The rioters also had, if not the support, at least the sympathy of many political and intellectual leaders, including important newspaper publishers. In all these ways the New York draft were similar to the fighting in Europe during the failed revolutions of 1848 and the carnage of the Paris Commune in 1871. 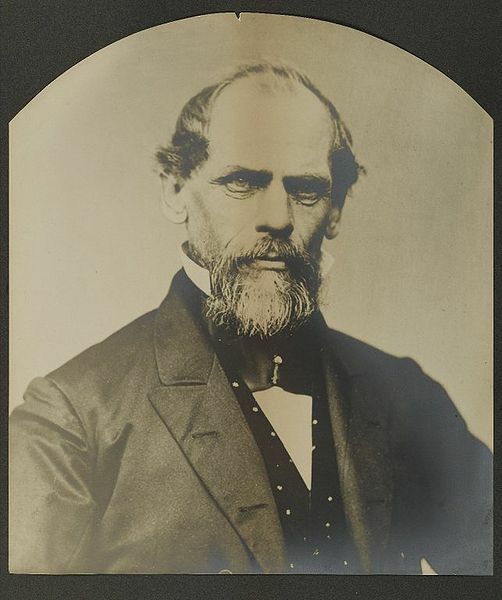 I don’t know if it is a stretch–maybe not–but Schecter argues that Reconstruction began with the Emancipation Proclamation on 1 January 1863. He carries the story into the 1870s, which is something too few “Civil War” books manage to accomplish. I wanted to re-read the book to refresh my memory and get some new insights to incorporate into my Interpretation at Governors Island this season. Much of the military response to the rioting came from the Department of the East headquarters there in the harbor. These are the types of things I am exploring as I get ready for Cooperstown and for the Governors Island season. Four years ago, just prior to getting married, I moved from an apartment I had lived in for twelve years to another about five blocks away. Overall, the move wasn’t much: same grocery store, post office, dry cleaner, etc, etc. The big change (other than the marriage) was that I was no longer so close to Prospect Park. An extra twenty minutes each way may not seem like much, but it adds an almost-prohibitive amount of time to a potential weekend walk or evening stroll after work. Brooklyn’s Prospect Park was designed by Frederick Law Olmsted and Calvert Vaux and, though not as well-maintained, is very much the equal of their earlier Central Park. (Central Park is better maintained because the rich folks who live along its perimeter give piles of private money for its maintenance.) For me it was a big loss, though one that came with an equally big win: I am now just five minutes away from the gates of Green-Wood Cemetery. Green-Wood is one of the original garden cemeteries and is currently celebrating its 175th anniversary. 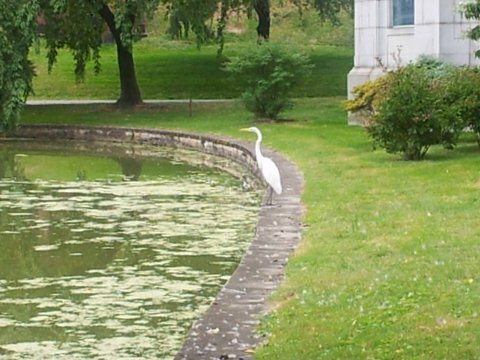 To mark the occasion the Museum of the City of New York is hosting an exhibit titled A Beautiful Way to Go: New York’s Green-Wood Cemetery. It opened yesterday and runs through October 13. Garden cemeteries, sometimes called rural cemeteries, were a phenomenon of the nineteenth century, when American and European societies were industrializing rapidly and green space was becoming scarcer and scarcer for city dwellers. It may surprise you to know that in the late nineteenth century Green-Wood was the most-visited place in New York State after Niagara Falls. Graveyards are for the dead, final resting places for those who came before us and have now passed on; cemeteries are for the living, places to commune with nature and the past. One hundred and seventy-five years later Green-Wood is still serving this function. No matter how many times I have been there–and it is in the hundreds by now–I always see something new on each visit. 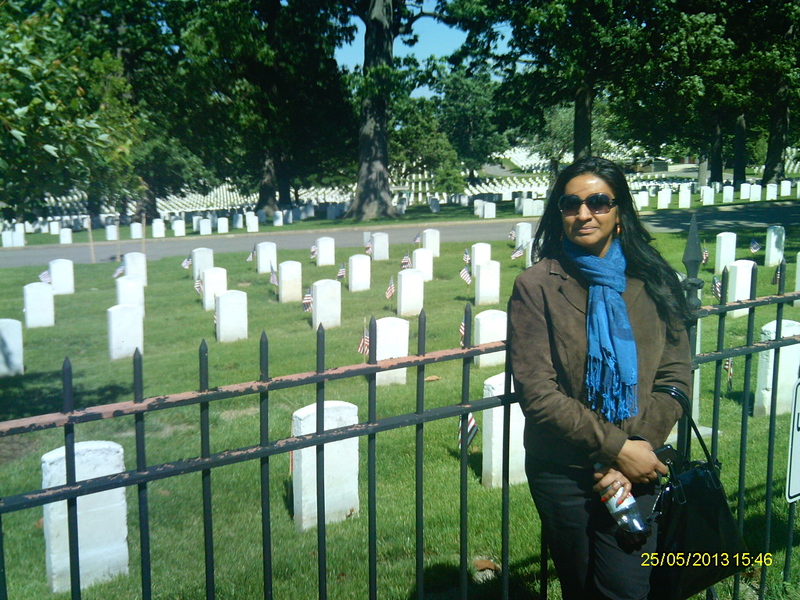 It is not hard to do, whether it’s reading the many freshly-planted headstones of the 4,000 Civil War soldiers buried there, poking my head into the bars of a mausoleum to peek at the Tiffany windows, or seeing the sun hitting a familiar vista at a different angle during the change of seasons. I am looking forward to catching this show in the coming weeks, and will have more to say about it here on the blog after I do. 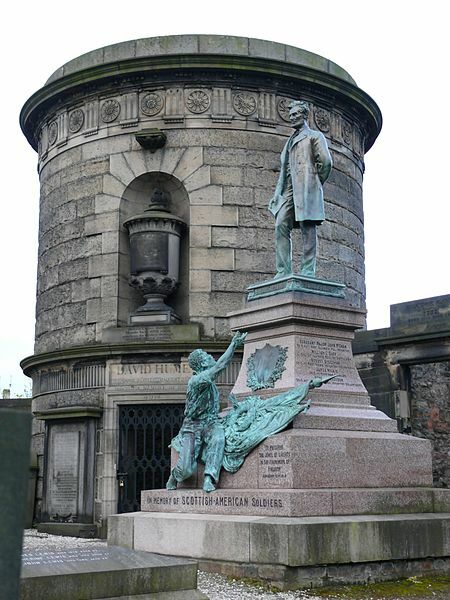 An interesting vignette came to my in-box yesterday about the George E. Bissell statue of Lincoln that stands in Edinburgh’s Old Calton Cemetery. Bissell’s name does not carry the same weight as Augustus Saint-Gaudens, Daniel Chester French, or Paul Manship, which is unfortunate because the sculptor was very much their equal. Bissell created one of my favorite statues in all of New York City, the monument to Chester Arthur that stands in Madison Square Park. Bissell’s Arthur stands adjacent to the more lauded Saint-Gaudens’s tribute to Admiral Farragut. Sadly, both are off the tourist path and stand equally unnoticed by New Yorkers themselves as they go about their daily routines. Bissell’s Lincoln was dedicated in 1893 and was the first of many Lincolns erected outside of the United States during the era. As you can see, it fits neatly into the “Standing Soldiers, Kneeling Slaves” motif described by Kirk Savage in his book of the same title. 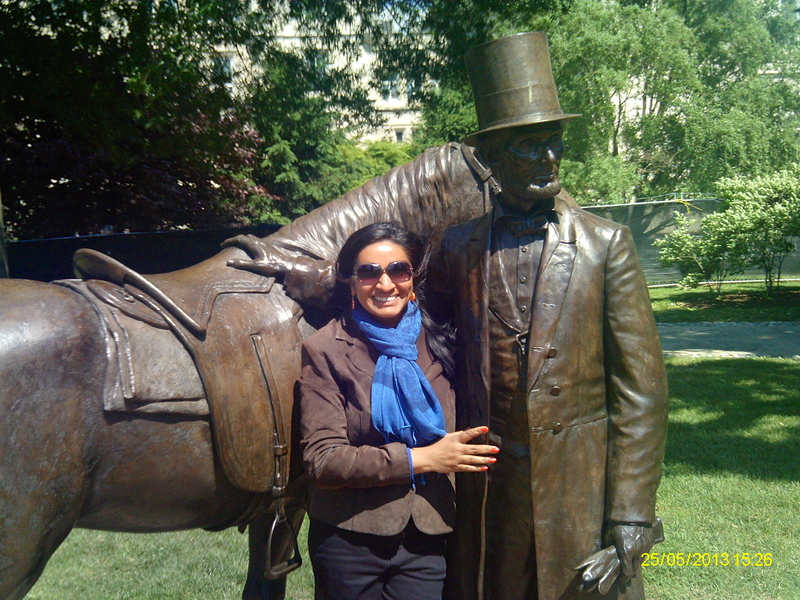 We have our own such statue, for Henry Ward Beecher, here in downtown Brooklyn. Bissell’s Lincoln is more than a tribute to the Great Emancipator, however; it was also built to pay honor to the Scots who fought for the Union. If you look closely, you will notice that it stands next to the tomb of philosopher David Hume, which could not have been coincidental. We are clearly meant to associate the two men and to think of them as equals. In the tradition of the time turnout was significant for the dedication, so much so that tickets were required despite the blustery conditions. It is lost on us today how seriously people of the period took these kinds of things. Bissell’s Lincoln is a good reminder, too, that the world was paying attention to the events in the United States during our Civil War. The Civil War and American Art exhibit ended its run at the National Portrait Gallery a few weeks back and is currently under installation at the Metropolitan Museum here in the Big Apple. It will be showing all summer and is well worth the trip. Though I saw it in DC, I intend to go back–probably more than once–during its time here in Gotham. There are many great works in the show; my favorites were the landscapes of Conrad Wise Chapman, a Virginian who lived with his family in Italy prior to the war with his artist father. The Chapman works on display in this sesquicentennial show are primarily landscapes he painted for the Ordinance Bureau during the Confederate defense of Charleston Harbor. On the simplest level the paintings work as literal representations of Confederate camp life during the siege, just as Winslow Homer’s sketchings depicted the quotidian life of Union soldiers. Chapman’s works are more than that though. Whatever his thoughts on secession, slavery, and the other issues of the day, Chapman was an artist of the first order. He reminds me of the Dutch Masters in his use of natural light. He was equally adept at depth and scale. Chapman was all but forgotten in the decades after Appomattox. Southerners, impoverished by the war’s destruction, did not have the financial resources to buy art the way their Northern counterparts did. The overt Confederate imagery was another minus in the art market of the Gilded Age. 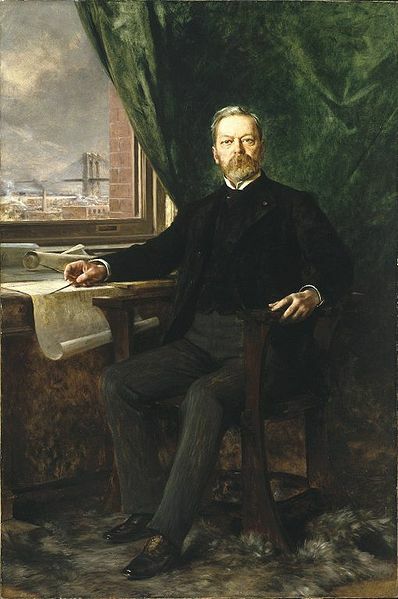 Chapman remained active throughout the late nineteenth and early twentieth century, mainly living as an expatriate in Mexico and Europe. Most of the Charleston Series ended up in the care of the Museum of the Confederacy in 1898. Chapman lived another twelve years and died in poverty in 1910. Now we may be entering something of a Chapman renaissance. First, there was his place in the Civil War and American Art exhibition. Now, Sotheby’s is auctioning one of his postwar paintings, Paisaje del Valle de Mexico con el Lago de Texcoco, later this month. The landscape is projected to sell for a cool $125,000-175,000.